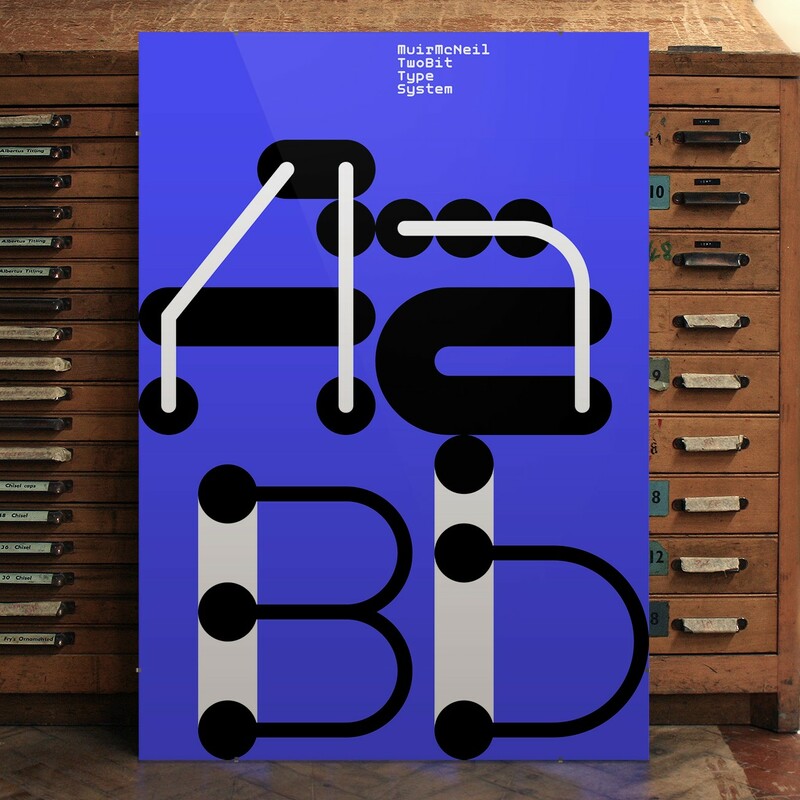 In MuirMcNeil TwoBit, individual characters and letter segments operate as variables within visual systems, a feature common to almost all MuirMcNeil typefaces. A grid shared with the TwoPoint and TwoPlus type collections determines positioning for both component contours and spaces in all TwoBit typefaces, with every element and space aligning precisely. TwoBit typefaces are designed to offer a huge range of visual possibilities by interacting with one another. Working with page layout, bitmap or vector design software, users can apply selected styles to letterforms and background panels either in precisely interlocking layers or in easily calibrated offsets, applying outlines, tints, colours, textures, patterns and transparencies as appropriate. Overlaid in pairs, TwoBit’s 35 fonts allow for a possible 1,225 combinations and, when selectively implemented with any of the 76 MuirMcNeil TwoPoint and TwoPlus collections a possible 12,321 combinations can be achieved. These features provide an enormous number of possibilities when working in print and fixed media. They are also particularly useful in motion graphics where their precise layering and positional calibration can provide perfect control over transitions and other exciting visual opportunities. Users should note that the versions of TwoBit supplied as multiple Postscript paths are configured to function as design tools. They may not render correctly on screen and could perform unexpectedly on low resolution laser printers. Users are therefore advised to convert complex designs to outlines before sending to output.